Hosted at Legal Draft Beer Co. (Address: 500 E Division St, Arlington, TX 76011) Emceed by Barside Jive’s Darrell Chumley. 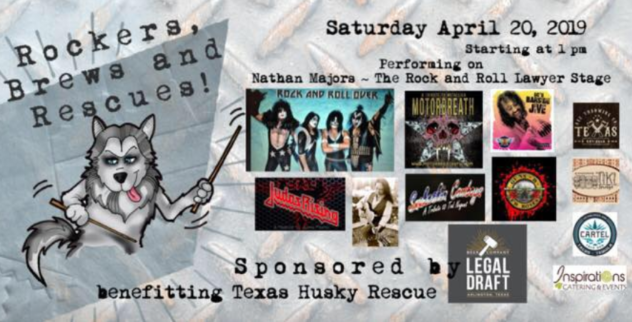 Come rock with Snakeskin Cowboys – A Tribute to Ted Nugent, GnFnR – a Guns and Roses Tribute Band, Judas Rising – Judas Priest Premier tribute band, MotorbreatH DFW – Metallica Tribute, and the Ultimate KISS Tribute band – Rock and Roll Over! 4 Kahunas Tiki Lounge, Inspiration Catering and Events, Texas Axe Throwing Co, and Cartel Taco Bar will also be there.